Hungarian Be'la Ferenc Dezso Blasko was born in October 1882 in the small village of Lugos. By the turn of the new century, young Bela fast established himself as a working stage actor in Budapest. After the devastating first World War, Lugosi arrived in America in the early 1920s. Having already worked in various silent films in Germany, a now experienced Lugosi set about sculpting a new career in cinema stateside. He landed work as the Count in the 1927 Broadway stage adaptation of Bram Stoker's Dracula, a fortuitous and fateful gig leading a few years later to his star turn in Tod Browning's 1931 celluloid classic. And while director Browning once preferred horror icon Lon Chaney for the role of the infamous bloodsucking count (Chaney died in 1930), clearly Lugosi made the role his own...for all eternity. Bela's thick accent and garish appearance enhance Browning's already moody direction and gothic vibe; Bela's spirited portrayal of Dracula took its place almost immediately as the archetypal depiction of Stoker's most memorable horror creation. A perfect companion to Shelley's lumbering Frankenstein. But 1931's Dracula was no less significant for Lugosi himself than for the rest of popular culture. His career off and running, Bela followed with a spate of notable horror gems including 1932's White Zombie, 1934's The Black Cat and 1935's Mark of Vampire (another project with Browning). 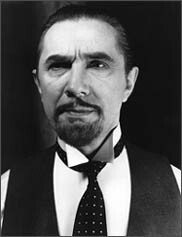 The 1940s saw Lugosi's genre output continue at a breakneck speed. The early part of the decade saw Bela most notably in 1941's The Devil Bat and 1942's Night Monster. Lugosi scored work in the exceptional 1945 horror classic The Body Snatcher...but unfortunately, such a high mark wouldn't set the tone for the remainder of Bela's career. While the latter half of the '40s gleaned some fun from the actor (specifically 1948's memorable Abbott and Costello spoof), the 1950s in general were a whirlwind of questionable (if not bad) choices...among them 1952's Bela Lugosi Meets a Brooklyn Gorilla. Physically and financially ravaged, the horror icon died in 1956 at the age of 73. Fittingly, he was buried with his Dracula cape.